I have drafts to be finalized on queue but I think this post takes precedence over the rest. I’m so thankful for my two days off which gave me enough time for my kitchen shenanigans aka Thanksgiving preparations. As customary, the first order of the day is preparing the citrus brine for the star of the Thanksgiving dinner. I prepared this on Wednesday evening so the bird soaked in it overnight and didn’t wash the brine off till an hour before roasting time which was 4:00 pm Thursday. This is a 19.42 lb bird which I brined in a mixture of apple cider vinegar, brown sugar, kosher salt, garlic, black peppercorns, fresh orange juice, orange peels, bay leaves, fresh rosemary and thyme and cinnamon sticks which was boiled then cooled completely in an icebox. 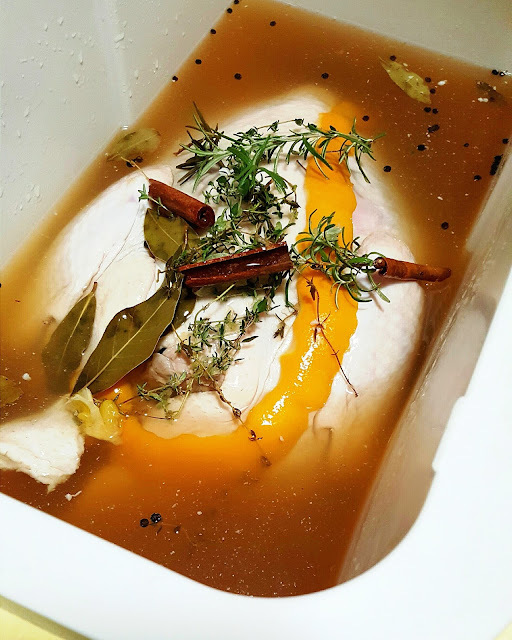 Once the bird is sitting in the brine, I topped it with ice cubes. 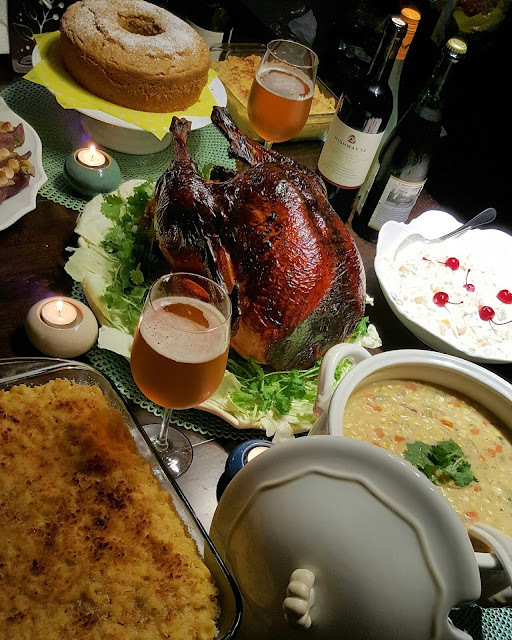 The next day, I added quartered fresh lemons and the juice off them to the brine and would occasionally turn over the turkey to make sure both sides are evenly brined. After rinsing off the brine with cold water, I let the turkey sit in a colander to drain off excess water then patted it dry (including the cavity) with paper towels. I scooped the cinnamon sticks and the sprigs of rosemary and thyme from the brine and stuffed it inside the cavity along with 2 diced apples and a stick of unsalted butter. The exterior is just massaged with canola oil off it went to the oven on convection mode at 400 degrees F for 30 minutes just to achieve that golden color then I reduced the temperature to 350 degrees. It took three hours more to cook plus fifteen minutes resting time before serving. 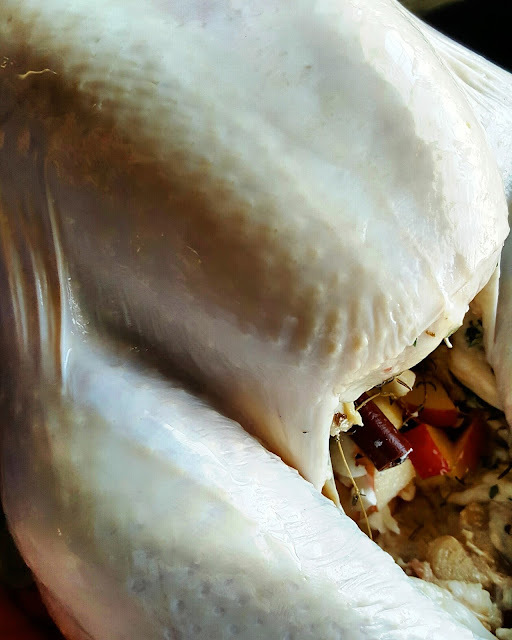 The result is a moist and tender turkey with crispy skin which is so tasty and flavorful it didn’t need gravy but that’s only me. The rest of the clan loves gravy so I must cater to them. Part of the dinner ensemble is Mac and Cheese which is I prepared simply by making a béchamel sauce with lots of freshly grated sharp cheddar cheese, nutmeg, freshly cracked black pepper and crème fraiche. 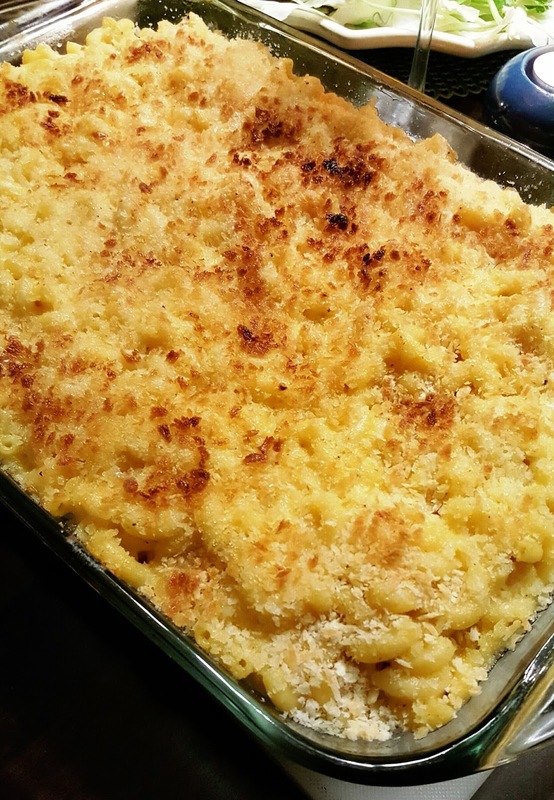 Topped with Panko bread crumbs and melted unsalted butter then put in the broiler to brown the tops equals delicious! 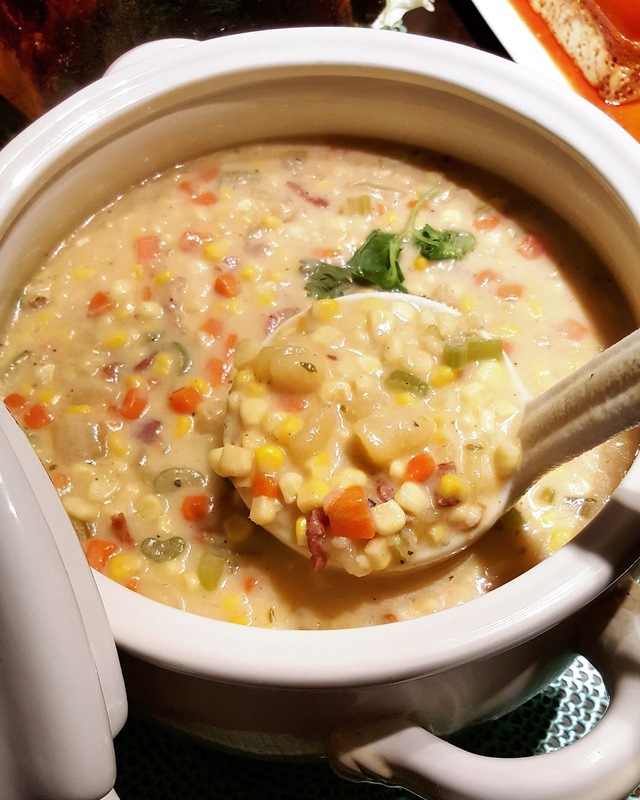 For our soup, I made Corn Chowder using fresh white and yellow corn with onions, garlic, Klondike Rose potatoes, celery, carrots, chicken broth, freshly cracked black pepper, half and half for creaminess and crisped bacon bits for that smoky flavor. It was creamy, chunky, hearty- actually a meal by itself. Our Thanksgiving dinner will not be complete without Twice Baked Sweet Potatoes with Marshmallows. 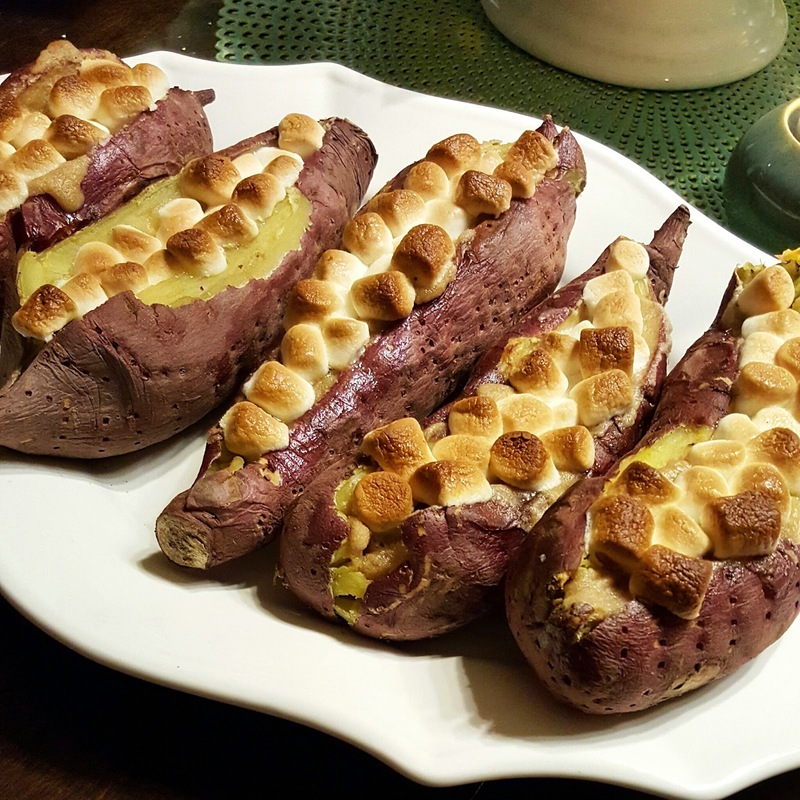 The sweet potatoes are baked whole first till they’re fork tender then split in two and topped with a mixture of unsalted butter, brown sugar and ground cinnamon with mini marshies on top then baked again till the marshmallows are toasted and bubbly. I didn’t take an individual picture of the cake but I made a simple Pumpkin Chiffon Cake which I dusted with powdered sugar and fruit salad for dessert served with flan. Of course we had some virgin drinks for the minors and “spirited” ones for the adults. It was a simple feast but more than that, a celebration of thanks and gratitude all our blessings; another year of existence. What a feast! Wish I were one of the guest of honor!! Aw you're so sweet! And you know how I always want to share what I make and bake with you! Thank you! Just type "Happy to be back" on the search bar. Happy cooking!